It might be China that is infamous for making cheap knock-offs of branded goods, but India is decidedly not too far behind. From leather purses (made, no doubt, from the skin of cows who did not qualify to be gau mata) to shirts to automotive parts, we can find the uniquely Indian ‘branded hai, boss’ goods in any popular market. This imitative tendency extends to writing as well. So Chetan Bhagat’s success with romantic comedies has led to a profusion of romance novels by Indian authors that flood the bookstores like the Mumbai rains – and are as unwelcome as the floods they bring. And Amish Tripathi’s runaway success with mythological fantasy has meant a vast number of imitators in that genre as well, giving us a combination of Sanskrit, old Indian legends and a variety of fantasy tropes derived from the works of Tolkein, Sanderson and GRR Martin. I had written at length about this phenomenon in an earlier post, available here. In this midst of this, Faith of the Nine comes across as a distinct attempt to break away from the crowd. 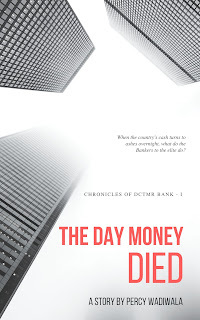 For one thing, the author does not take the easy way out by setting his novel in Vedic times. The period that Faith takes place in is closer in terms of society and technological state to India during the early days of the first Delhi sultanate. The language used is also of a higher quality than one is used to reading of late – indeed, much higher – from Mr Dev’s contemporaries. 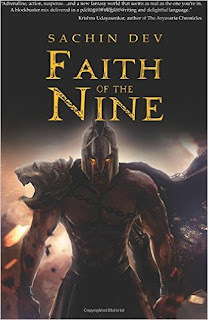 Faith of the Nine follows an overall theme of the monotheistic ‘Nam’ Empire where the older, polytheistic religion (the titular Faith of the Nine, an origin myth that is reminiscent of Tolkein’s Ainulindale which in turn draws upon the Bible) has been systematically stamped out. As conspiracies and murders erupt around the capital city, the three main characters – General Fateh, a battle-weary soldier, Abhaya, a young acolyte of the old faith and Ishan, an orphan boy of eleven years being raised in the priesthood, find themselves thrust headlong towards an apocalypse. The past is fleshed out gradually over the course of the book, through flashbacks and story-telling, as each of the three main character meets or reminisces on their own mentors. The pace is high throughout, with very limited letting up – something is always happening to the characters, and people, places and concepts are always bubbling over, sometimes more quickly than the mind can grasp. Of the main characters, the first glimpse we have is of General Fateh as a young soldier in his first battle, his hero-worship of his father and later of his own development into one of the Empire’s top military commanders. Mr Dev does a good job of portraying Fateh as a dedicated soldier unused to deception, focussed on his military expeditions, who is later brought to a role at court. Once there, he finds himself quickly drawn into the machinations and dirty tricks of the other courtiers, including the de facto ruler of the Nam Empire, Jehangir and the mysterious third member of the ruling triumvirate, Tamanjin Nasri. As Fateh tries to extract some semblance of truth out of the many versions of the story of an assault on an outlying village, he finds himself confronting apparitions and shadow-warriors he had not thought existed, and challenging the basic tenets of his own faith. Abhaya is a ‘Kwah-Seer’ monk, ordinarily residing outside of the Empire, in the desert, who is drawn by a thoughtless prank into the capital of the Nam Empire and forced to witness the hanging of two of his boon companions. During his own escape, he meets Ishan the acolyte of the new faith. Later, Abhaya realises that his order are not just seekers of a lost religion, and that his own role in the crisis of his time will be more than that of a witness. Battles against long-extinct creatures in the sand ensue and Abhaya finds himself once again searching for the boy who will be the redemption of the Faith of the Nine. Ishan is a boy born in the dead of night in the midst of blood and chaos, watched over by nine spirits, even as his mother commits suicide. Raised by his nanny, Bajah, Ishan grows up a precocious child, learned in the faith of the great Pruksa (the God of the new, monotheistic faith) but ever-curious about the truth and the origins of the world. A chance encounter with Abhaya the heathen monk leads Ishan on a path that ends in a daring escape from the virtual prison that has been his abode since birth. While Fateh is a complex enough character, we do not see enough of Abhaya over the course of the book. Hopefully, the next instalments will show us more of this interesting character. Ishan, thus far, is a well fleshed-out but does not break the mould of the ‘boy-hero’ of other fantasy stories, his development over the next few instalments will be interesting to see. As I have mentioned before, Mr Dev’s writing is of a higher quality than most of his contemporaries. A sincere effort is made to give distinct voices to each of the characters as well as to differentiate between the social classes on the basis of how they speak – which is more than you will see in most places. There are places where a phrase or word struck me as incongruous – ‘salt thrown in a soda drink’ certainly does not seem appropriate for a book of this nature – but for the most part, the tone if Faith is more consistent than in Amish’s works, if one must compare the two. At times the language gets almost too heavy-handed, as the author seems to revel in showcasing his powers at the expense of readability, but this is, of course, a personal opinion and quite possibly reflective of the reviewer’s limited reading capability than anything else. A smoother flow would have helped in making the book more accessible, but it is upto the author to decide how he wants to pitch his language, I suppose. There are many things to like about Faith of the Nine. On the balance though, the writing can get over-wrought at times. Besides, though this is the first instalment of a trilogy, a bigger payoff – some sort of conclusiveness at the end – would have helped. Still, fans of genre fiction might find this an interesting and different experience. The book has been received as a review copy. The reviewer is not acquainted with anybody involved with writing the book.